Where do you usually fish. Ballast Point can be very productive with Trout, snook and reds and even snapper around some of the rocks which you can reach. I just spoke to a few anglers that fished that area a day or two ago and said they caught some nice trout up to 21 inches. When I can get a hold of a canoe or kayak I usually fish the Rocky Creek area. Otherwise I'll try Fort Desoto, Picnic Island, Honeymoon Island, or any of the beaches from Redington to John's Pass. I don't know any other places to try out. Those are some good places. On another note there is a google map that will have all great fishing locations from land, bridge, pier, boat, kayak or canoe. I believe it is up on the front page. Take a look at the map, find the place you like to fish and then match it up with maybe the report from the Captain that fished that area last. Example you said Honeymoon Island. I just fished that and had 2 banner days snook fishing. I wrote the report under North Pinellas. The key was the last time I was there the report was that I did poorly. Tides and location and baits were the key. You would pick that up on the forum. On another note do you like catching stripers! I have a place. Yes hybrid stripers big ones. I'll check that feature out.I like anything on the end of my line that pulls. I've never caught a Striper before though. I woke up this morning at 5:30AM excited for a day on the water. Headed out to Ballast Point and started chumming with Tropical Fish Food. After about a half hour of casting the net, I only came up with about a dozen greenies, a couple of which were porkchops, and about 5 pinfish which seemed a bit large. I casted 2 rods with the greenies hooked in different places. One rod with a pinfish. and the other two with the large greenbacks. After about 5 minutes the first reel started screaming. As I fought that one, another hookup on my other rod. I pulled the whiskered fish up and headed over to my other rod and pulled up another cat. Fifteen cats later and I decided to switch over to artificials to try and catch something different. I fished a gulp shrimp which only produced some more cats. I called it a day. I'm sure the trout, snook, and redfish are there somewhere; you just have to find a spot that's not catfish infested. I don't plan on coming over here for a while. The bay is catfish Infested. Can you Imagine if trout hit and ate like a cat! Wow. I would target them all the time. That would be great! So what about those stripers you mentioned earlier; you left me hanging. Which kind, Hardheads (more implants from India or Pakistan) or Sailcats? Average size is about 2.5 pounds with larger fish caught in rough waters just before a storm or in the late fall and through the winter. Maximum size is about 2 feet in length an 13 pounds in weight. Live shrimp, small crabs and small live pin fish are good natural baits. Artificial worms and spoons also work well. The fish will feed throughout the water column, but baits fished near the bottom work best. Taste is great if dark meat is removed and skinned. (fillet them and cut the red lateral line out of each fillet to prevent "muddy taste").It is found in brackish waters, including estuaries, lagoons, brackish seas,also mangroves and the Inshore off the beaches. In addition to humans, predators of the gafftopsail catfish include the Tiger Shark and Bull Shark. When removing the hook from this catfish, be careful of the poisonous spines on the pectoral fins and dorsal fin. Legend is that the skull of the sailcat resembles Christ on the Cross andsometimes you can clearly even see the spear wound. Ff shaken, you might hear rattling, which is said said to be the sound of the dice thrown for His robes.The sound is actually 2 small bone structures that allow the live catfish to keep it's equilibrium while swimming.While the Crucifix isn't rare, it is supposed to bring good luck to the finder of one that will rattle. To find Christ on the cross, cut off its head and boil away the skin, meat and all other slimy stuff, remove and give a good soaking in bleach will take care of that. Rinse it well and let it dry in the sun. They're a fun fight when nothing else is biting. I kept two one day and removing the skin was an arduous task and the meat didn't taste too good. It was probably because I didn't remove the lateral line as you mentioned. Another down side is this slime that they leave on your leader. WHAT IS THIS STUFF?! It's as if they hocked up a loogee on your leader. Disgusting lol. I fish that area alot this time of year. I target snapper, snook and if I want to just find some action the sharks are thick this year. Here are a few photos from a trip I took with Stowawayjr a few weeks ago. We were very close to Ballast point when I took these photos. Do you know where the Orient road jail is? The dam area next to the jail is loaded with them. Thanks a lot Dave. I'll go ahead and check that out. What do you recommend I use to catch them? Dave, I went out to that spot you showed me dressed in shorts. I didn't know the grass was that tall. I ended up fishing a little south of the ICW only to catch catfish.Is the road you take to get there a white gravel road with tall grass? When I got out to the bank of the ICW I saw that the dam was about a 1/4 mile away. Do you have to cross the railroad tracks? 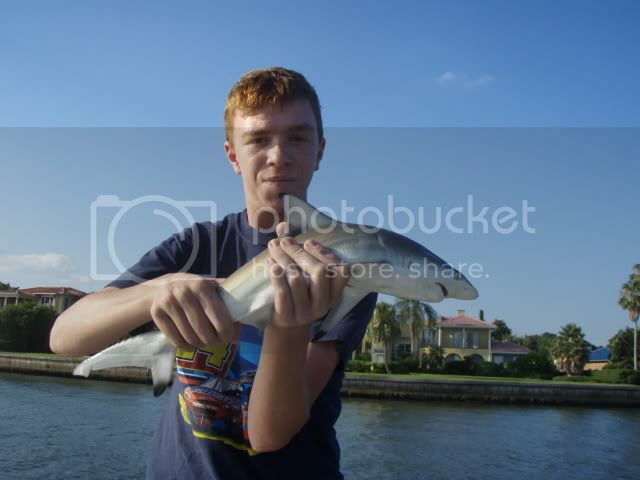 http-~~-//www.youtube.com/watch?v=Ao7-HPMo49A I caught three this size Dave and a couple of ladyfish. You gotta go with me one day and show me how it's done. 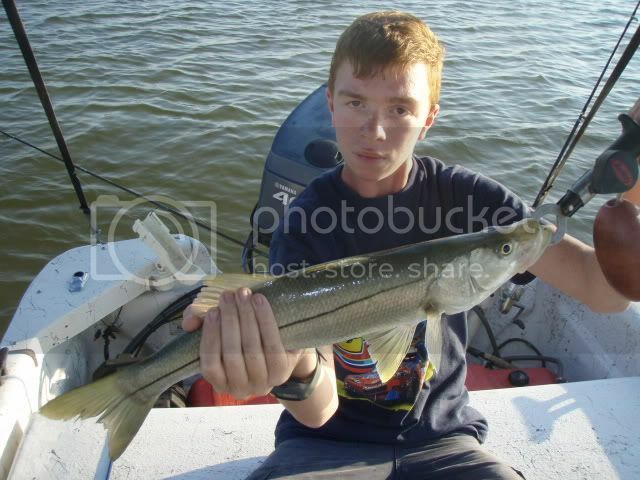 This is my friend's first Snook. The stripers are being caught at the bypass canal overflow dam, next to the orient point jail. They are a cross between a White Bass and a Striped Bass and are called Sunshine Bass. They are fat and pretty neat. The lines in these hybrids are broken. In that same spot there are monster snook and small tarpon to b about 70 pounds. We will all have to take a Online Fisherman trip. I was out there for a while casting it into the eddys with different lures and cut finger mullets. Finally when I decided to cast into the mangroves to the right is when I landed a couple of those small snook. The ladyfish were hitting the lures out by the eddys though. We do have to take a trip out there Dave. Hey! I knew that boy when he was a little kid. LOL!